Did you know there were actually two Boer Wars, one was in 1880-1881 and the second in 1899-1902. Both wars were between the British Empire and the Dutch settlers of two independent Boer republics, the Orange Free State and the Transvaal Republic. These wars are more properly referred to as "the 1st and 2nd South African Wars" this is because the black population of South Africa were also involved in the conflicts. The southern tip of Africa had been shared between British colonies and independent republics of Dutch-Afrikaner settlers, known as Boers (which is a Dutch and Afrikaans name for farmer). In an attempt to escape the British rule many Boers moved north and east from the Cape to settle on new lands which eventually became the Boer Republics of the Orange Free State and the Transvaal. The relationship between the British and the Boers was not good, with Britain extending its control by annexing Natal in 1845. The First Boer War (1880-1881) was a rebellion of Boers against the British rule in the Transvaal that re-established their independence. The conflict occurred as the Pretoria government became increasingly ineffective at dealing with growing claims on South African land from rival interests within the country. The photo on the right shows a group of soldiers wounded in the Boer War sit beside a hospital tent in South Africa, 1900. 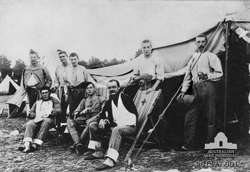 The soldier seated on the far right in the deck chair bearing a red cross is Private William Gamble, 1st Contingent Victorian Mounted Rifles, Wounded at Pink Hill, Rensburg 12-02-1900. He arrived back in Australia 24-05-1900. The war was between the Transvaal Boers and the British; the Boers became angry when the British annexed Transvaal in 1877. In 1877 the Northern Sotho (Pedi) attacked the Boers of Transvaal, and the Boers claimed the British had inadequately assisted them. Many of the Transvaal population were in debt to Cape bankers, which seemed to increase the negative perception the British had of the Boers. The British wanted to force Transvaal into a union, which increased the chance of war. The Boers were encouraged into armed resistance after the British defeat by Zulus in 1879 at the Battle of Isandlwana. 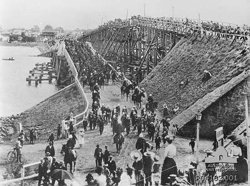 In the 1880s, the discovery of gold and diamonds in the Boer republics intensified the rivalry, as British subjects flooded into the Boer territories in search of wealth. The rights of British subjects in Boer territory, British imperial ambition, and the Boer desire for to stay outside the British Empire all caused more friction, which in 1899 provoked the Boers to attack in order to prevent what they saw as an impending British conquest. 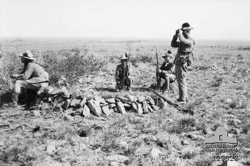 The Second Boer War (1899-1902), in comparison was more prolonged and involved, troops from British colonies such as Australia and New Zealand, as well as militia and volunteer contingents supporting the regular British Army from the UK. The war ended with the conversion of the Boer republics into British colonies and a promise of limited self-governance. These colonies later formed part of the Union of South Africa. In many respects, the 2nd South African War was a wake-up call for the British Army which suffered heavy casualties, the majority of these as a result of disease rather than shot and shell. Scorched earth is a military strategy which involves destroying anything that might be useful to the enemy while advancing through or withdrawing from an area, for example food sources, transportation, communications, industrial resources and people. The photo on the right shows Australian troops watching a Boer outpost. The policies of "scorched earth" and civilian confinement in concentration camps, which were taken on by the British to prevent support for the farmers/Boer commando campaign, destroyed the civilian populations in the Transvaal and the Orange Free State, the news of which led to a significant decrease of support for the war in Britain. Australians & New Zealanders at home initially supported the war, but became discouraged as the conflict dragged on, especially as the effects on Boer civilians became known.